Winter is that time of year that we start spending a lot of time indoors. But indoor air pollution can cause a host of short-term health problems. It can give you headaches, cause dizziness, and lead to nausea. It's a common cause of fatigue. It's well known that poor air quality can trigger allergies and lead to respiratory problems. It can even cause diseases like bronchitis. Research shows that air pollution levels can have a big impact on your heart health. In fact, if you have heart disease and have already suffered an event like a heart attack or stroke, the level of pollution in the air you breathe could be setting you up for a second dangerous incident. Subjecting yourself to high levels of air pollution may actually increase your risk of a second heart attack or stroke by a full 43 percent. Researchers on the project say that level of increased risk probably underestimates the true impact of air pollution on heart health. The quality of air you breathe also affects your mind. It can impair cognitive function, reducing your attention span and impairing memory function. Fine particulates in the air you breathe may form deposits in your lungs and brain. The higher the levels of fine particulates in the air, the greater the impact on your cognitive function. High levels of carbon dioxide that build up in indoor spaces – especially in energy-efficient buildings with lots of people, like your average office building – also impair your cognitive abilities. The decision-making abilities of people working in such circumstances tend to suffer under even moderate exposure to carbon dioxide. So, if you ever wonder why so many people at your work make dumb decisions, it might literally be something in the air! Particularly at this time of year, when we seal our homes up tight against the weather, the quality of the air can drop rapidly and that can have serious consequences for your health, both in the short term and for the long haul. Your home should be a safe space... somewhere you can breathe easy, knowing that nothing threatens you. But the air quality in your home could be a threat your health. The Environmental Protection Agency lists indoor air pollution as one of the top give environmental public health concerns. 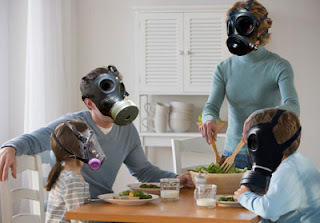 Common sources of indoor air pollution include mold, bacteria, dust mites, pollen, animal dander, cigarette smoke (if anyone in your home smokes), chemicals left behind by cleaning products, and byproducts produced from heating your home and cooking. The average person spends nearly ninety percent of their time indoors, and many studies estimate that indoor air in the typical home or building is at least 25 times more polluted than the air outside. The American College of Allergists states that half of all diseases are either caused by or aggravated by poor indoor air quality. Fortunately, cleaning up the air quality in your home isn't difficult or expensive to do. 1. Check your ventilation. Today's energy efficient homes tend to trade high efficiency for poorer air quality. Not enough air from outside enters the home to dilute pollutants and not enough air escapes to allow the pollutants to leave. One of the easiest ways to improve air quality is to simply crack a window or two for a couple of hours each day. The downside is that your furnace will have to work a little harder to heat your home during the day, but your home's air will be much healthier. 2. Keep your floors clean. Most pollutants settle out of the air when left undisturbed. But, then people walking through the home, the furnace kicking on, the front door opening and closing – these can all stir up those pollutants making them easier for you and your family to breath in. Not good. If you clean your floors regularly, you'll trap many of the particulates and get rid of them. That's good news for the air you breathe. Use a vacuum fitted with a HEPA filter that you clean regularly. Mop at least once a week. And put down welcome mats for people to wipe their feet on before entering your home. These three easy steps can dramatically reduce the indoor pollution in your house. 3. Test for radon. Radon is one of the most dangerous indoor pollutants – it's a leading cause of lung cancer. You can pick up a radon testing kit on Amazon for under $30. The test is easy to do, and can help you identify whether or not this dangerous pollutant is a problem in your home. 4. Switch to natural cleaners. A lot of chemical cleaners leave behind harmful compounds in the air. Something as innocent as a plug-in air freshener, for example, can release more than 20 kinds of volatile organic compounds into the air. Using cleaners and air fresheners that use mostly natural ingredients can be a big help in terms of air quality. Seventh Generation products are a good choice for natural cleaning supplies. When it comes to freshening the air, try bringing a small pot of water to a simmer. Drop in a couple of cinnamon sticks and apple slices. The scent will beat the socks off of artificial air fresheners and it's better for you, too. 5. Change your HVAC filters often. Many folks procrastinate or forget about this obvious way to reduce allergens in the air. You can even install ultraviolet lighting within the furnace which helps kill bacteria as they circulate through the system. 6. Pay attention to the humidity in your home. If you air is too dry or too moist, it can create conditions that increase the pollution in your home. Try to maintain humidity levels between 30 and 50 percent for the best air quality. Breathing is important. So, take control of your home's air quality. You and your family will spend less time suffering from colds and allergies, you'll have more energy and better cognitive function, and you'll reduce your risk of heart disease while you're at it.